Participation is open to: teachers (pre-school, primary, secondary, vocational, adult, special needs), teacher trainers, careers officers, educational guides and counsellors, inspectors. Preparation: This course is based on the activities of two Comenius projects, the Spatial Citizenship for education (SPACIT) project examining the linkages of geo-media and the citizenship dimension in society and the digitalearth.eu project, connecting people who are using geo-media technologies in schools. It follows the very successful digital-earth Comenius courses held in Salzburg (AT) in 2012 and 2013. Some preparation will be required for participants based on online materials. Teachers can apply for the training and use the methodology they will be required to log in to the course area, fill in their profile and answer a short pre-course questionnaire. Objectives: The use of ICT and Geoinformation in citizenship education is important in most school curriculum subject areas. Most mobile and tablet devices are spatially enabled, that is to say they have location-based services (i.e. spatially enabled mobile devices, online mapping tools, volunteered geographic information) enabled. We can also access different forms of media that relate to our location. This geo-media have become easily accessible in everyday life. Using ICT for citizenship in schools offers training to raise awareness of both the opportunities as well as impacts and challenges of using geo-media in society. The course will present an approach to develop the capabilities for young people to successfully participate in the emerging geoinformation society and to explore awareness, participation and communication as responsible “spatial citizens”. A spatial citizen should be able to interpret and critically reflect on the information they society, communicate with the assistance of ICT tools and technologies, and express opinions using geo-media. These capabilities will be addressed at secondary school level. We aim to provide all means necessary for teachers to integrate the use of ICT, critical thinking and spatial responsibility in their lessons. Teachers will become aware of the advantages of using ICT and be able to design their own materials. 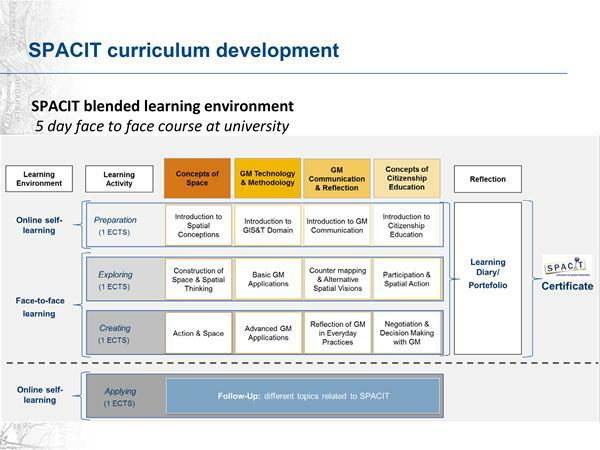 Methodology: In the first module, the course participants will be introduced to competences concerned with citizenship and the role ICT plays, as well as spatial thinking. This is followed by basic exercises with ICT. During the second module of the training course, the course participants will work through a series of exercises that have direct links with classroom practice. In a third module, didactical guidelines will be presented that can be used by the course members when developing their own activities and exercises for their own students. Participants will then develop an exercise, individually or in teams. These exercises will be presented for peer review. Certificates (3 ECTS) will be awarded at the end of the programme. Follow-up: Participants will retain access to the materials used and developed through the course. They will be able to customize and develop them for the use with their own classes. Concepts association with citizenship education, freedom of information and role of communications will be introduced. The significant of location-based technologies will be introduced and ideas concerning spatial thinking will be developed. The 1st module gets you acquainted with the broad range of use/possibilities with ICT, through demo and interactive web applications. You are introduced to Web-based tools through making some basic exercises. Competences will be introduced. The second module consists of a series of activities developed for different subjects, levels and complexity, these will further improve your skills and understanding of the connections between citizenship, the places we live and ICT. The course does not aim to develop a manual for software programmes, but to use ICT as a tool for investigation and the responsible use of information by citizens. In this module, you are introduced to methodological and didactical guidelines that can help you develop your own exercises that fit in with your lessons. Pedagogical issues are covered and data sources and information. You work together in groups with other European teachers to create your own exercises with geomedia. Day 5: Participants share their findings/developed learning environments. The session is concluded with a ceremony of the presentation of a course Certificate to all participants. There will be a seminar for teachers in organising and applying for a (European) project and you will get some project examples of best practice. There will also be a fieldwork visit, this will depend on the weather forecast.